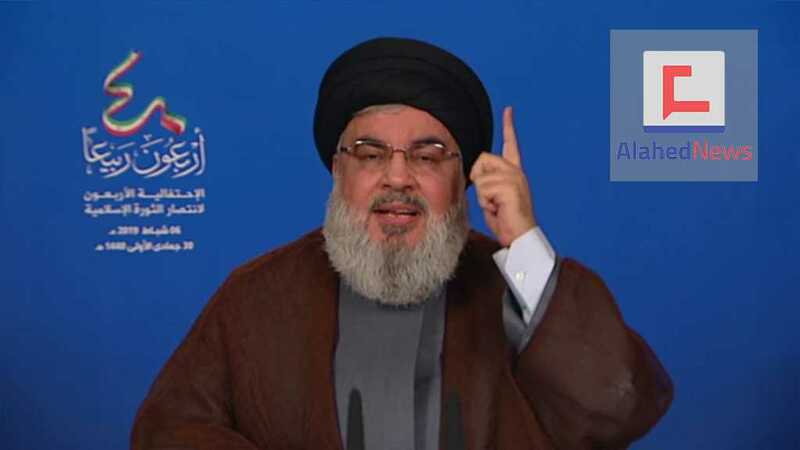 “In the military field, wouldn’t people make an uproar and accuse Hezbollah of dragging Lebanon into war should the party shoot down an “Israeli” aircraft attacking Lebanon?” Sayyed Nasrallah wondered, noting that he is also ready to talk to Tehran on supplying the army with any arms and equipment it needs. The Enemy Threatening from behind the Wall for 20 Days… Remains behind It! 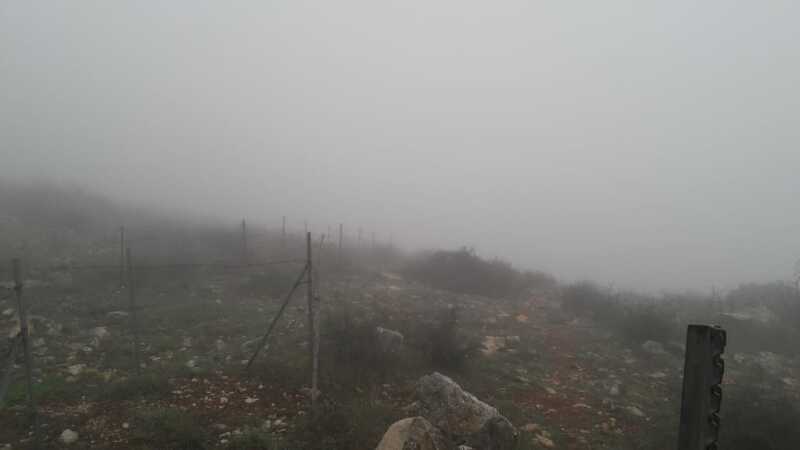 On the morning of December 4, people woke up to news reports about the implementation of new measures by the Zionist enemy along the Lebanese border. These measures were labeled using different descriptions and accompanied with the word “operation”- in the hope that they would have a greater impact on the readers and viewers. In addition, a broad objective was announced, which included the exposure of “tunnels” that the “Israelis” claimed Hezbollah had dug into the occupied territories. What was the scene at the border that morning? At first glance, many believed that the enemy would escalate the situation as the noise from behind the wall of four “Israeli” diggers got louder. The excavators were positioned between two points: the first near Fatima Gate and the second near the water line on the Kafr Kila-Odaise road. The entire Hebrew-language media, western outlets as well as the “Israeli” army’s Arabic and Hebrew speaking spokespersons positioned themselves at a point overlooking the excavations. The airwaves were opened for most channels to broadcast the event. Leading the “Israeli” army’s charge were soldiers carrying either handheld or cameras mounted on their heads. Two soldiers belonging to the war media department were deployed at each of the two points. It only took the “Israeli” army two hours to announce that it discovered a tunnel and broadcast a photo. “Israeli” media reports were peppered with plenty of exaggerations and highlights of the supposed achievements. An hour after the enemy broadcast a simulated image of the tunnel on Lebanese territory followed by a video, it was clear that “Israel” had prepared in advance because it was impossible to photograph so deep underground with such speed using a small camera. Here lies a paradox. While it was able to achieve such rapid and gradual progress – media wise – with respect to the tunnels in Kafr Kila, it failed to do so in Ramyeh. The “Israelis” had dug 36 wells opposite to the village of Ramyeh. 18 days later, the enemy announced it blew up a tunnel. It, however, failed to present proof of its existence. There was also no media coverage. Similarly, “Israel” has been digging in the areas opposite to Aita al-Shaab and Blida. The work is still ongoing, but with no apparent results. This raises a question. Is this not the same army that discovered a tunnel within two hours? How come it is unable to back its other alleged discoveries with evidence? The enemy’s new measures have been accompanied by a campaign of intimidation against Hezbollah, the Lebanese state and civilians through the hacking of local communication networks and the sending of threats through voice messages. How did the Lebanese face this challenge? The Lebanese media’s role should be commended in sending a counter message to the “Israelis”. The Lebanese state dealt calmly and wisely with this issue and rejected the dictates of the enemy. The Lebanese army, which was in contact with the “Israeli” soldiers, proved its ability to take the initiative and not to give up a single inch of land based on the trilateral equation. This was evident in the events that unfolded in Mays al-Jabal. The enemy was forced to move back its barbed wire along five points. At the last point the barbed wire was moved back by about five centimeters. The Lebanese army emerged victorious in the war of wills. As far as the masses were concerned, there was an increase in the number of Lebanese cars driving along the border just a few meters from the “Israeli” diggers. 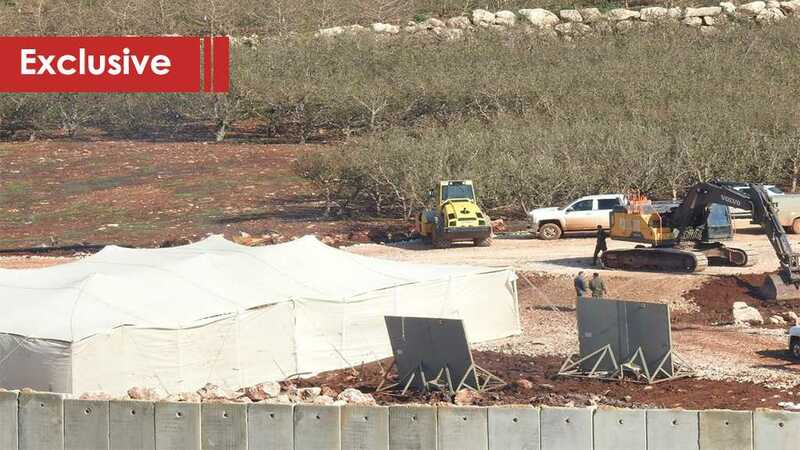 The enemy threatened the Lebanese people and warned them to stay away from the vicinity of the excavation areas, but they did not seem to care what was happening behind the wall. Elsewhere in Kroum al-Sharaqi, “Israeli” soldiers became the subject of jokes thanks to the media’s psychological warfare policy. Pictures and activities mocked “Israeli” soldiers. They exposed the weakness of the heavily armed “Israeli” troops. In one picture, a soldier is seen dozing off while on guard duty. In another, the soldier breaks the service rules by showing his face and smoking a cigarette in secret behind a rock. Another soldier is shown brandishing a rifle at a child carrying a toy bulldozer. For its part, Hezbollah remained silent on the grounds that everything taking place across the border does not require any comment. On the other hand, the “Israeli” operation cast a shadow of anxiety and tension over Zionist settlers who feared a response. This prompted “Israeli” Premiere Benjamin Netanyahu to visit the Misgav Am settlement, opposite to the border village of Odeise, and meet with the heads of the so-called local councils in Kiryat Shmona to calm them down. So did the chief of staff and some of the other top leaders. The “Israeli” media’s task was redirected from broadcasting news about the tunnels to ensuring a state of calm among the settlers. In addition, the enemy transformed the Metula hole into a ‘monument’ and invited all foreign diplomatic missions there. The objective here is to pressure Lebanon in international forums. It is worth mentioning that all the incidents along the border involved the occupation forces and the Lebanese army, especially in Mays al-Jabal. However, the enemy’s media distorted the truth and included Hezbollah in every incident. As the objectives of the “Israeli” project – which were based on intimidation and threats – fail, it is clear that the media’s efforts in this affair remained confined behind the wall. And the settlers alone hear them amid the silence of the “Israeli” bulldozers along the border. Today, the “Israelis” are back to the same old “wall” symphony. The enemy resumed work on installing an iron fence after briefly halting construction to focus on the excavations earlier this month. In the end, the enemy did not record any military, media or psychological achievements from its measures. On the contrary, it lost more of its people’s trust. It did not impose any new equation on the opposing side. The developments exposed that “Israel’s” actions were fuelled by their Lebanese obsession, which is ever-present. This calls for more self-confinement by completing the construction of the wall at new points. This is what the commander of the “Israeli” army’s Galilee Division, Rafi Milo, recently promised during his meeting with the settlers along the Lebanese border. Filed under: AngloZionist Empire, Hezbollah, Lebanon, Lebanon's army, Palestine, Zionist entity | Tagged: America Goes after Hezbollah, ‘Hezbollah Tunnels’ |	Comments Off on The Enemy Threatening from behind the Wall for 20 Days… Remains behind It! 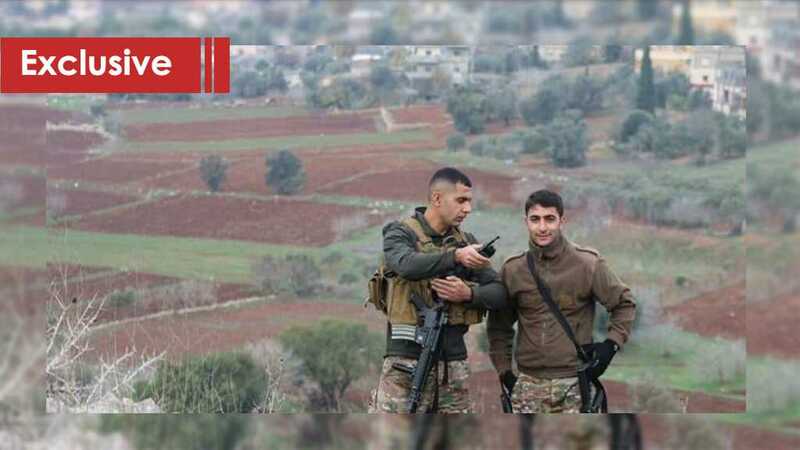 In the most recent act of heroism and valor, two Lebanese Army soldiers stood up against the “mighty” undefeated “Israeli” army in the southern Lebanese village of Meis al-Jabal. 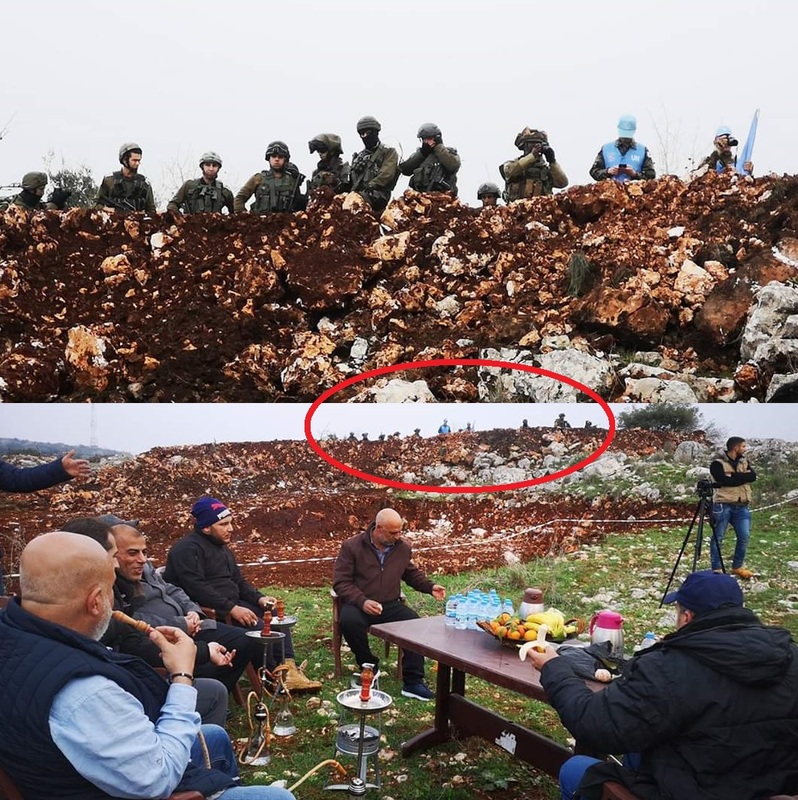 With only meters away from the “Israel” Occupation Forces [IOF] troops, both soldiers refused to giveaway even a small piece of Lebanese land to the occupying entity. On Monday, Lebanese soldiers and IOF came head-on when the “Israelis” crossed the so-called “Blue Line” demarcated by the United Nation. The IOF troops were pushed by the Lebanese soldiers. A video of the incident which went viral on social media, showed one of the Lebanese soldiers brandishing his assault rifle, while the second telling the United Nations Interim Force in Lebanon, or UNIFIL, that the border goes behind the tree – not in front of it. 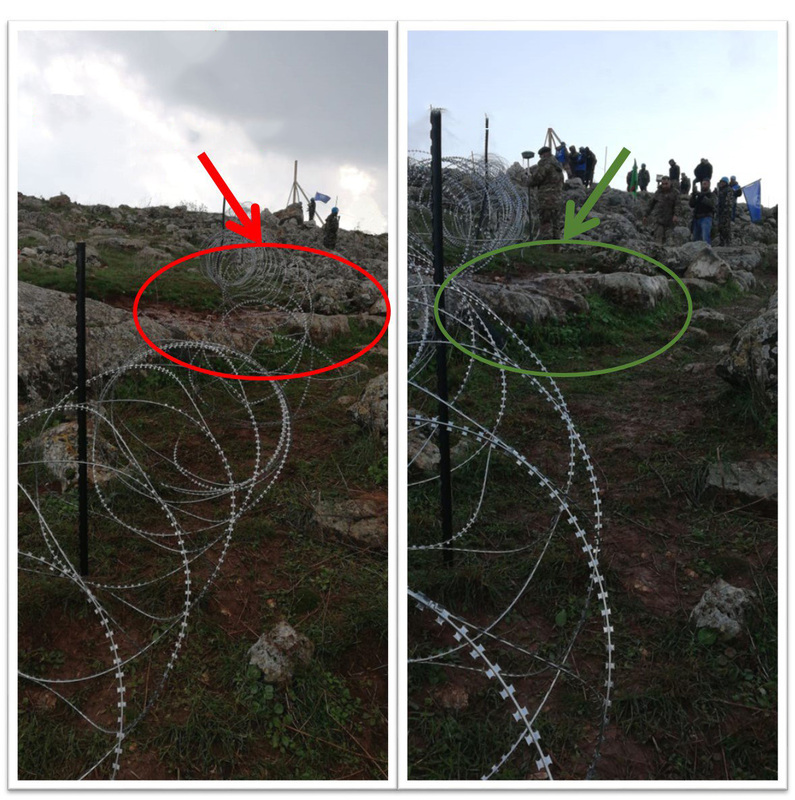 The Lebanese soldiers – making sure not to commit any act of normalization with the “Israeli” troops – asked UNIFIL members on site to tell the invading soldiers to move the barbed wire they had placed. “Sir, they [the ‘Israelis’] tell us [they’ll put it] behind the tree,” one Lebanese soldier is heard telling the UNIFIL officials, going on to point out that the barbed wire is in fact being laid on the Lebanese side of the tree. The two soldiers identified as Corporal Ahmed Saleh and First Lieutenant Mohammed Qrayani. Both had been widely praised on social media. Qrayani is the son of Fatima Ezzedine who burned an “Israeli” tank in South Lebanon during the 1984 “Israeli” occupation. A hero born from a hero’s womb! The “Israeli” entity’s air force had on many occasions violated sovereign Lebanese airspace, territorial waters, and lands. Just between 12:53 a.m. and 6:49 a.m. on Monday, the Lebanese Army reported that an “Israeli” military boat had violated Lebanese territorial waters near Ras al-Naqoura. 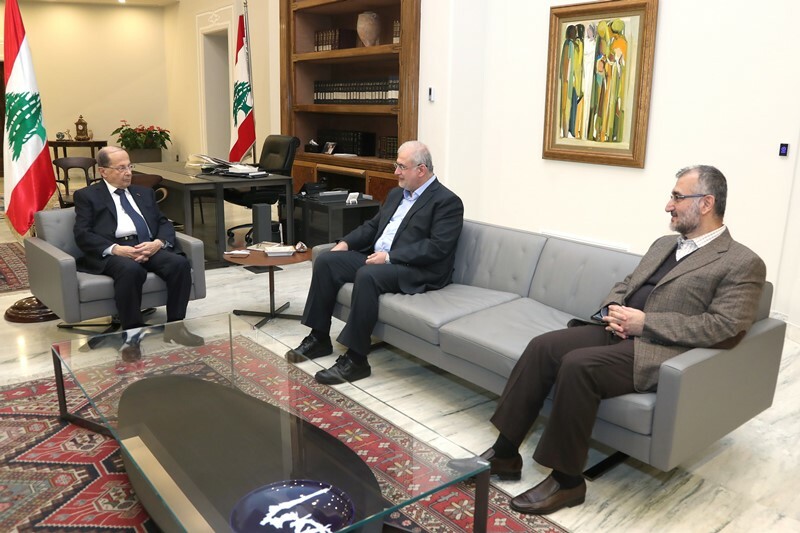 The Lebanese President Michel Aoun received on Tuesday Hezbollah Secretary General’s political aide Hajj Hussein Al-Khalil and head of Loyalty to Resistance bloc MP Mohammad Raad as the discussions tackled the latest developments of the cabinet formation process. After the meeting, MP Raad told the reporters that it was a brainstorming session which reviewed the various suggestions to end the governmental vacuum. The caretaker prime minister Saad Hariri was tasked to form the new government on May 24, 2018; however, the political parties have not agreed on the distribution of the ministerial seats, which has delayed the cabinet formation. Since the Zionist prime minister Benjamin Netanyahu accused Hezbollah of storing and developing missiles in residential areas and at civil facilities, Lebanon and the whole world expected a military escalation on the Lebanese-Palestinian border caused by any Israeli mad move. The expectations were substantiated by the Zionist claims about alleged Hezbollah tunnels on the southern border in order to move the world countries against the Resistance and justify any aggression on Lebanon. However, the balance of deterrence imposed by Hezbollah military power prevented the expectations from coming true, and ironically the Israeli soldiers deployed on the border with Lebanon have become a joke as the Lebanese public enjoyed making fun of them. The story started when the Zionist occupation army units advanced into the border area off Mays Al-Jabal town (Southern Lebanon) in order to put demarcation marks on the Blue Line before the Lebanese army rejected that and forced the enemy troops to retreat. Al-Manar correspondent Ali Shoaib reported that a Zionist tank advanced into the border and directed its cannon into the Lebanese town before the Lebanese army directed its cannons towards the Israeli tank, forcing it to back off. Meanwhile, the Zionist occupation military announced that two machine guns were missed in the border area, which made the so-called “invincible army” so clumsy that it cannot even hold its guns. (Some social media users said that Hezbollah fighters seized the two guns in order to make fun of the enemy fragility. 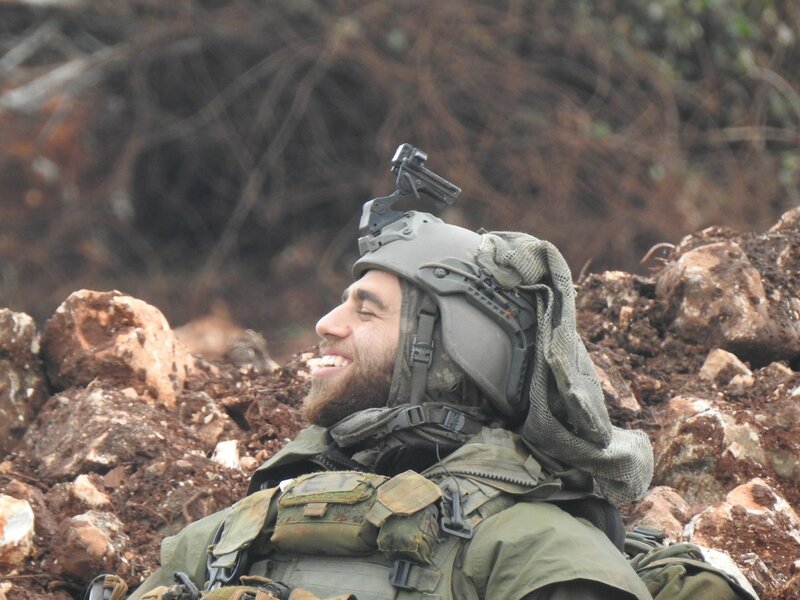 Hezbollah war media department launched an intensified campaign to show the weakness and fragility of the Israeli army, shooting the enemy soldiers from rear positions, which shows that the Resistance soldiers can infiltrate into their positions and capture them. Hezbollah phantom is always haunting the Israelis, imposing on them certain formulas which they would have never followed. The Israeli military fired warning shots at three supposed personnel of Hezbollah who approached one of its units while it was carrying out a mission near the separation line with Lebanon as a part of Operation Northern Shield, Lieutenant Colonel Avichay Adraee, a spokesman for the Israeli military, announced on December 8. “The Israeli Defense Forces [IDF] warns from approaching the area near the fence or its operation to discover and neutralize the terrorist tunnels. Anyone who tries to approach and sabotage the IDF efforts will be risking his life,” Adraee said on Twitter. From its side, the Hezbollah media wing said that the personnel who approached the separation line were of the Lebanese military intelligence. According to the source, a unit of the Israeli military was planting vibration sensors next to the fence when the incident occurred. The Israeli military launched Operation Northern Shield on December 4 to destroy cross-border tunnels between Lebanon and Israel. So far, only two short tunnels have been allegedly discovered. Today’s incident shows that the situation in southern Lebanon may escalate further. Two days ago, Israeli Prime Minister warned that the Israeli military may have to operate in Lebanon to counter the threat of Hezbollah tunnels.